Did John Mc Cain, Susan Collins and Rand Paul Stop Seniors From Being Kicked Out of Nursing Homes? Seniors all over the US , many of whom were middle class, worked all their lives but have spent down their retirement, will lose their federal safety net in Medicaid if the ACA is defeated by the Republican Senate, October 1. For the second time Senator John McCain a war hero and now brain cancer patient, who wants to the Senate to follow the rules of order, and Susan Collins a compassionate Republican ,along with Dr. Rand Paul ,a Republican who thinks the bill is not severe enough, may save seniors from losing nursing home coverage with Medicaid once again. The New York Times reported in a June attempt to gut the ACA New York Times that this includes middle and upper-class seniors who have used all their savings because they have no choice but to remain in a nursing home. The June New York Times story covers Alice Jacobs, 90, who once owned a factory and horses. She has raised four children and buried two husbands. But years in an assisted living center drained her savings, and now she relies on Medicaid to pay for her care at Dogwood Village, a nonprofit, county-owned nursing home here. “You think you’ve got enough money to last all your life, and here I am,” Ms. Jacobs said. Medicaid pays for most of the 1.4 million people in skilled nursing homes, like Ms. Jacobs. It covers 20 percent of all Americans and 40 percent of poor adults. But little has been said about what would happen to older Americans in nursing homes if the cuts took effect. How Do Geriatric Care Managers Give Quality of Life and Joy to LGBT Clients? BT aging LGBTy of life of residents living in residential care. This showed, according to lead author ” the importance of providing a holistic, person-centered approach that goes beyond satisfying the technical and procedural aspects of care” Finding activities that help elders grow and nurture their emotional, intellectual, physical, and/or spiritual quality of life can help to nurture an older person’s whole life and bring back joy. For example, look at this you tube on an older woman who reconnected with art, which is her talent and spirituality and younger people plus her family, through a quality of life assessment. But what about the quality of life for LGBT aging clients. This recent article in the New York Times shows how one retirement community responding and found joy for LGBT clients, where many LGTB aging clients have to fight for acceptance. If aging life or geriatric care manager want to find resources for LGBT aging clients or more about their issues, The Journal of Aging Life Care has an article with many resources to help you serve these vulnerable clients in finding Joy and acceptance. 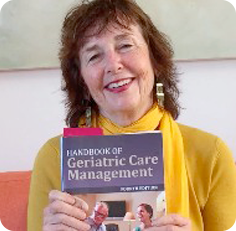 The Handbook of Geriatric Care Management 4th edition has a seminal chapter written by geriatric care manager Nina Herndon with a quality of life assessment to help you pinpoint the quality of life needs of all clients . ORANGE, Va. — Alice Jacobs, 90, once owned a factory and horses. She has raised four children and buried two husbands. Medicaid pays for most of the 1.4 million people in nursing homes, like Ms. Jacobs. It covers 20 percent of all Americans and 40 percent of poor adults.